October 2014 – Tools for strategic and strong-minded thinkers! Strategic thinking describes the individual’s capacity for – and practice of – using their mind to identify and apply factors that will result in success in the future. I’ve always felt that finding an opposing concept to contrast with strategic thinking would help my readers to develop an understanding. He or she manages a factory that is focused on production of a widgets. Everyday raw materials come in, and widgets go out. Although there can be considerable variation in the quality of the inputs, quality of the means of production, and demand, the system is more-or-less predictable. The operational thinker values predictability and stability. Even though the production system might be complex, a disciplined systems thinking approach can reveal the main drivers of performance; thus, it a linear and quantitative thinking approach is useful. I’ve met many people like this, and you probably have too. Although many begin their careers with a capacity for strategic thinking, after a while they lean so heavily on operational thinking that it becomes their dominant thinking habit. One key element is associated with the processes and systems that surround them; processes eliminate ambiguity but strategy is inherently ambiguous. Most everyone dislikes ambiguity, but can tolerate it to some extent. I think that most operational thinkers find ambiguity to promote a lot of anxiety. Consequently, they find ways to simply avoid it. This denial explains why externally imposed change is so disruptive to organizations. Operational thinking, like strategic thinking is purposeful. The distinction is OT’s focus is on success in the present. The operational thinker has a strong production orientation and the importance of the production orientation comes to dominate their thinking. Is there a way to measure or contrast operational versus strategic thinking? I think there is, and it is based on the work of Anthony Gregorc, who has attempted to measure four learning styles that he terms concrete sequential, concrete random, abstract sequential, and abstract random. Operational thinkers are strong on dimension of concrete sequential work. They are organized and like to get to the point. They value predictability. Operational thinkers are also good with analysis and structured methodology, which is in Gregorc’s abstract sequential domain. Strategic thinkers, by contrast, are open to experimentation and new viewpoints; these are qualities of Gregorc’s concrete random domain. Strategic thinkers are also imaginative, like the big picture, and flexible, which are in Gregorc’s abstract random domain. Take a look at the two nearby graphics. Operational thinking is more characteristic of the bottom half and strategic thinking is on the upper half. I have discovered several patterns from the results of people who take the test. The box pattern suggests that the person is equally comfortable with operational and strategic thinking. 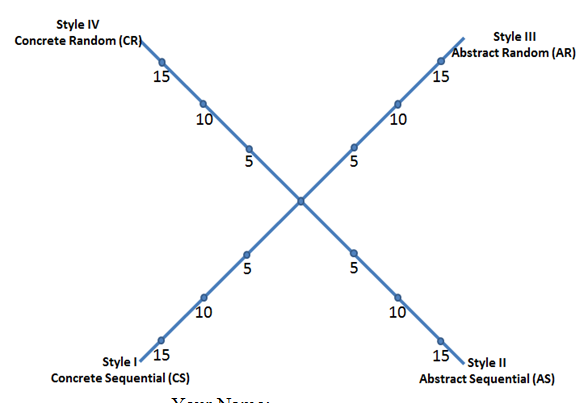 The kite pattern is similar to the box, but the person has a stronger preference for one of the four axes; a tail toward abstract random would probably indicate a strong strategic thinker and a tail oriented towards concrete sequential would indicate a strong operational thinker. Arrowheads have weak orientation on one axis. Spears are long and skinny patterns. Do you agree with my characterization of operational thinking? Do you agree that it is the “opposite” of strategic thinking?